The Freedom Z is built with the same focus on durability, comfort, and quality performance that defines every Scag mower. Tough and dependable, it's ideal as an entry-level commercial mower or for the homeowner who wants professional-quality results. 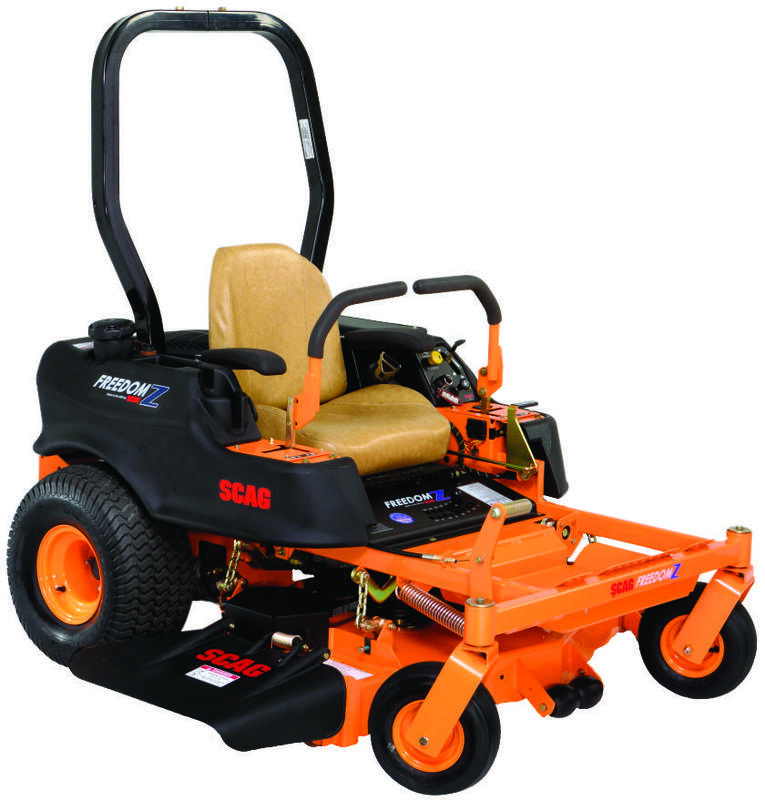 This ergonomically designed mower includes a heavy-duty tubular steel frame, commercial grade Ogura PTO clutch, and independent Hydro-Gear transaxles. Maintenance is a breeze thanks to simplified grease points and sealed aluminum spindles with ball bearings. A cushioned, adjustable seat assures comfort as you work, and a quick, convenient 1/4" cutting height adjustment allows you to achieve that perfect cut without a struggle. With ground speeds of up to 8 mph, this mower is a solid, surefooted performer on any job. -48" cutter deck with anti-scalp rollers provides a beautiful quality-of-cut. -Sealed aluminum spindles with ball bearings deliver "maintenance-free," high-performance operation; 1/2" thick mounting flange. -Comfortable, thick-cushioned seat is easily adjustable and delivers a high level of operator comfort. -6.5-gallon total fuel capacity maximizes refueling intervals to save time and get the job done fast. -Cup holder and storage tray built into fuel tank for operator convenience. -Innovative height-of-cut adjustment is quick, and conveniently adjusts in 1/4" intervals. -Foot pedal cutter deck lift is spring-assisted and makes raising the cutter deck smooth and easy. Adjustable height-of-cut from 1" to 4 1/2" in 1/4" increments. -Interlocked parking brake system prevents movement when parked on slopes. The mower will not operate with the brake on, preventing premature brake wear. -MARBAIN cutter blades stay sharper, longer. -Self-adjusting belt systems keep belts in constant, proper adjustment for long life. -Easy-to-release dump valves on transaxles allow the mower to bemoved without the engine running. -Hydro-Gear ZT2800 hydro transaxles (2 independent units with charge pumps and all-metal gears) deliver smooth drive power while spin-on oil filters provide easy maintenance. -Ground speeds up to 8 mph for high productivity. -Large front caster tires and 20" drive tires for solid traction and a smooth ride. -Digital hour meter features pre-programmed maintenance reminders. Hour meter only activates when the engine is running to accurately record engine time. -Highly flexible discharge chute will not dent and is easy on the landscape. -Low-profile, fixed-position Roll-Over Protection System (ROPS). -Commercial-grade powder coat paint for a high-gloss finish and increased durability. -3-year/500-hour non-commercial or 1-year commercial mower warranty. See the Scag Limited Warranty Statement for complete details.